Kate Condon, Nathan Welch, Adam Hawkins, and Earl Mattson collecting and processing tracer samples from within the SURF mine. 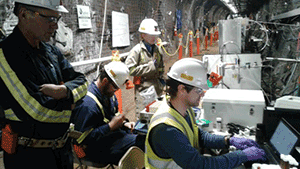 Two years after research began in a mine in Lead, SD, PNNL researchers are as excited about what they’ve learned as they are that it’s largely been done remotely. “Teams supporting space missions have been doing it for years,” said Alain Bonneville. “Our meetings are less dramatic, but we gather on-line, watch live data feeds from monitoring instruments in the mine, and adjust things accordingly,” said Tim Johnson. The PNNL team and its national laboratory collaborators from Lawrence Berkeley, Sandia, Lawrence Livermore, Idaho, Los Alamos, Oak Ridge, and National Renewable Energy Laboratory have been meeting twice a week for the past year, guiding experiments from their offices. The work is part of DOE’s collaborative Enhanced Geothermal Systems project, or EGS Collab. It’s a $9 million multi-lab project designed to perform field experiments and numerical simulations to understand the creation of fracture networks and fluid flow through networks of cracks deep underground. The mine, or Sanford Underground Research Facility, mimics rocks found deep in the subsurface where temperatures reach over 400 degrees Fahrenheit. That heat is a clean energy source that could be harnessed to power 100 million homes across the nation. When cold water is pumped through small fractures in the Earth’s subsurface, its contact with hot rock heats the water, which can be brought to the surface for conversion to electrical energy. The project began with various sensors embedded inside the mine. Some monitored seismic attenuation, some monitored temperature, and others—like those from PNNL—provided a picture of the geology and how fractures transported fluid as a result of the stimulation. “Surprises have been the rule, not the exception,” said Johnson. But the constant flow of data has allowed researchers the ability to tweak testing procedures in real-time. The ultimate goal, according to PNNL team lead Alain Bonneville, is to improve computational models of the fracking so that the work can be replicated in other places. “This mine is really a bridge from lab experiments to large field deployments,” continued Bonneville. Researchers anticipate collecting data from SURF into 2020; it’ll be a useful and natural transition to starting the Frontier Observatory for Research in Geothermal Energy Project, which is tasked with developing technologies to harness and use energy that is generated in the subsurface. The EGS Collab is funded by DOE’s Geothermal Energy Office and led by Lawrence Berkeley National Laboratory. Read more about PNNL’s previous EGS Collab work here.